India has since many decades now has always been known for good quality spices and therefore, there are many spices traders operating in India. The texture, quality, aroma, taste, and medicinal value of Indian spices is south to be best in the world. At present, India is one among the other largest producers and exporters of spices in the world. Out of 109 varieties of spices mentioned in the ISO (International Standard Organization), India at least produces 75 varieties. Most spices traders operate in small lands. 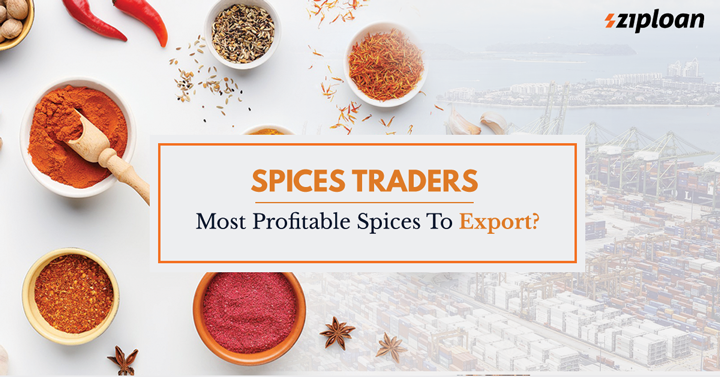 Let’s take a look at the top 5 spices which are most exported and make for a good business option for Indian spices traders. India is the leading exporter of mint products, it exported approximately 22300 tons of mint in the Financial Year, 2016-17. The total worth of the export is equaled to Rs. 2,52,750 lakh. The leading importers of mint products from India include China, the US, Netherlands, Germany, and France. As per the reports, India has exported 3130.37 tons of mint to the US while 9359.55 tons to China. This figure clearly shows that the mint and mint products can certainly be the most profitable spices that are exported from India. In terms of values, India is also a leading exporter of spice oils. 12,100 tons of spice oil of total worth of Rs. 2,30,775 lakhs was exported by India. The biggest importers of Indian spice oils are USA, Germany, South Korea, and the United Kingdom. The US and China exported 3041 and 1496.98 tons of spice oils respectively. Again with their export value, the spice oils business offers good profits to spices traders. In the financial year 2016-17, India exported 1,19,000 tons of cumin of total worth Rs. 1,96,320 lakhs. The US, UAE, Vietnam, UK, and Bangladesh are among the importers of cumin. India exported 1,16,500 tons of turmeric in FY 2016-17. Its total worth is Rs. 1,24,189 lakhs. Iran, USA, Malaysia, Bangladesh, and UAE are among the top importers. Iran is the largest importer of turmeric from India valuing almost Rs. 13575.50 lakhs. Turmeric, in addition, also has a good business in India as well. It is one of the most commonly used spices in food in India. Pepper is mostly grown in Southern India but India still is one of the largest exporters of pepper. India exported approximately 17600 tons of pepper to the countries including USA, Germany, UK, Sweden, and Japan. The value of pepper was approx. Rs. 114312.50 lakhs. As well all know that India is known as Land of spices. And that our country is the largest producer and exporter of spices in the world. Being spices traders and dealing in spices is certainly a profitable business. Additionally, there are several loan lenders who also offer spices business loan. You can also look forward to availing it to grow and expand your spices business in India. In addition, you can also register yourself and your business on Connect by ZipLoan for free to grow the business network and communicate with other spices traders, wholesalers, retailers and manufacturers in India. Next article How To Get A Loan For Small Clothing Boutique? What Are The Consequences Of Filing Late Income Tax Returns?